Anyone that has experienced it knows that there are few things worse as a motorcycle owner than feeling your bike splutter and grind to a halt at the side of the road. Breakdowns can be costly and if your motorcycle is your primary mode of transport, they can cause a major disruption to your life. If you are travelling on a busy road, breakdowns can be more than an inconvenience. High-speed traffic poses a threat to your safety. But stay calm. These are the four steps to take when your motorcycle breaks down to ensure you, and your bike, make it home safely in one piece. If you are by the side of a busy road, you need to make yourself as visible as possible to ensure approaching traffic sees you early. Have your hazards flashing on your motorcycle, or your turn signal, and move your bike as far away from the approaching traffic as possible. Once you are at the side of the road, you can inspect your vehicle to try and identify the problem. Depending on the tools available and your motorcycle knowledge, you may be able to identify and solve the issue at the side of the road. If this is the case, then providing you are confident that you are in no danger where you are, you can begin working on the issue. If you can’t fix the issue, you are going to have to get some help. It is worth establishing your precise location at this point. Try to establish what exists you are between so you can give an accurate location to the towing company. If your cell phone has a maps feature, finding your exact location is simple. But if it doesn’t there are other ways of establishing your location. You can flag someone down and do it the old-fashioned way. People are surprisingly helpful and willing to provide assistance to people who have broken down, particularly other bikers. But while this may be possible on busy roads, if you are off the beaten track it could be more difficult. If you are on a highway, you can look for the nearest highway marker. These are usually signage with numbers on it at regular intervals on the highway. The number will relate to the distance from a reference point. On interstate highways, this is the distance from the state line. At other times this could be a county border or arbitrary reference point. These numbers will help you determine your precise location before you call for assistance. When you have your location, it is time to call it in. It helps to be prepared and keep the name and number of a respectable motorcycle towing company with 24/7 availability in your wallet or somewhere you can access it if you ever break down unexpectedly. 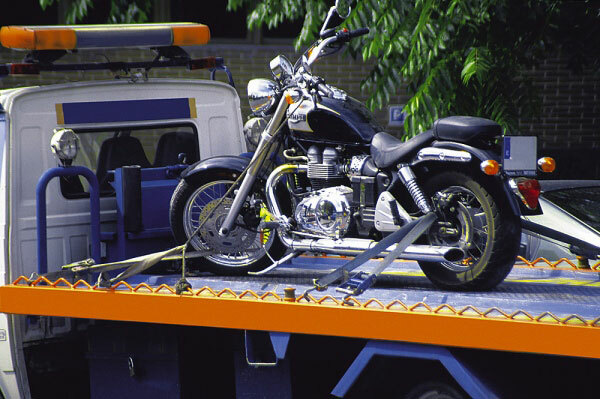 Read more about specialized motorcycle towing companies and how they can help you in a breakdown scenario.